Rio de Janeiro: Brazilian mining giant Vale says that communities in the south-eastern state of Minas Gerais have been ordered to evacuate after independent auditors found that one of its dams could collapse at any moment. On Friday, the company raised the level of risk at a mining waste dam in the city of Barao de Cocais to three, the highest grade. According to Brazil's mining and energy secretary, level three means that "a rupture is imminent or already happening". Residents in a 10-kilometre perimeter of the dam had already been told to leave by state authorities in February after Vale raised risk levels to grade two, a company spokesperson told the Associated Press on Saturday. 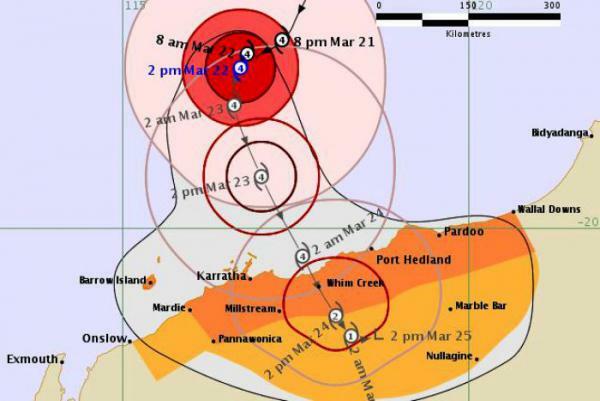 A red alert was issued on Saturday afternoon and is current for people in or near communities from Pardoo to Mardie, including Port Hedland, South Hedland, Whim Creek, Point, Samson, Wickham, Roebourne, Karratha and Dampier, but excluding Marble Bar. The latest rating changes are a byproduct of a more cautious stance by the investment banks on the mining sector after a promising start in 2019, especially in the long-term. Iron ore price has been soaring since the beginning of the year, partly due to Vale’s dam disaster in Brazil and the market fallout. The price surge drove Rio Tinto's stock up over 20%. BEIJING – Chinese steel mills are slowing iron ore purchases and seeking cheaper alternatives to Australian supplies after a steep run-up in prices in February, five mill executives and several traders told Reuters this week. "Even mainstream low-grade ore has soared to a level that we can't afford," said a purchase manager at a steel mill in Jiangxi province. FMG's Super Special Fines, a blend with iron content of only 56.7 percent, is now at a discount of 16 percent to benchmark 62 percent iron ore versus 33 percent last month. "(Moderating margins) have influenced customers' preferences for specific products and created increasing demand for lower-grade iron ore," said Danny Goeman, Fortescue sales and marketing director, at a conference in Beijing on Wednesday. "Non-mainstream products suddenly became very hot, although more people are asking rather than making actual purchases," said a manager at a major commodities trading house in eastern Zhejiang province. Mining giant Vale (NYSE: VALE) took a hit on Wednesday when Moody's Investor Service downgraded its debt to junk. Moody’s downgraded the miner’s senior unsecured ratings and the ratings on the debt issues of Vale Overseas Limited. The downgrades remove Vale’s credit rating from the investment range entirely. Brazil's mining agency (ANM) has ordered Vale (NYSE:VALE) to suspend operations at its Fabrica and Vargem Grande complexes, as part of an ongoing crack down following last month's deadly dam break at the iron producer’s Corrego do Feijão mine.